Safeguarding the well being of children is of paramount importance. 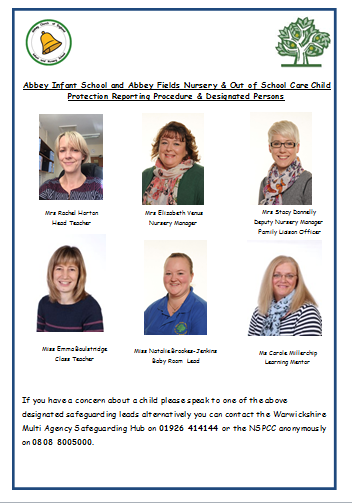 Abbey Fields has 6 designated Safeguarding leads on site at all times Elizabeth Venus and Stacy Donnelly, Natalie Brookes- Jenkins (Abbey Fields), Mrs Horton(Headteacher), Miss Bolstridge (Deputy Headteacher) or Mrs Millerchip (Abbey Infants) . If your child arrives at nursery with an existing injury we would appreciate that you inform us. This will be logged on an existing injury form and stored in the nursery office. We will ask you to record on the form details of the incident which we will then ask you to sign and give you a copy. Like wise if a child injures themselves at nursery you will be informed and a written copy of the accident/incident given to you. All information around Safeguarding can be found in a red file in the main nursery foyer and here on our webpage. This includes copies of our polices and procedures and local and national procedures and advice. Please note that should the need arise for us to inform Social Services then you will be notified in the first instance ,unless by doing so would put the child at risk of further potential danger.